He married Marjorie Gloria Henley9, May 27 19399 [Apr - 19394], Randolph, Utah9. 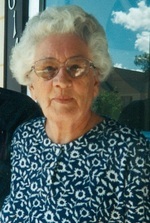 Marjorie, daughter of Albert Francis Henley & Mabel Warburton, was born Apr 4 1923, Evanston, Uinta County, Wyoming. EVANSTON -- Funeral services for Marjorie Gloria Roccaro, 83, will be conducted today at 2 p.m., at Crandall Funeral Home in Evanston. Interment will follow services at the Evanston Cemetery. Visitation is one hour prior to services. She died, surrounded by her loving family, on Jan. 22, 2007 in Evanston. She was born on April 4, 1923, in Evanston, the daughter of Albert Francis Henley and Mabel Warburton. She married Robert W. Hinshaw on May 27, 1939, in Randolph, Utah. They later divorced. She then married Guido "Guy" Roccaro on July 18, 1953 in Ely, Nev.
She loved to cook and sew. She also loved to play bridge with the Senior Center bridge group. She especially enjoyed going on trips to Wendover, Nev., with her sisters. She also enjoyed being in the company of her family and friends. She will be deeply missed by her loving family. She is survived by her children, daughters, Linda Martinez of Evanston, Jerri McKenzie and her husband of Green River and a son, Anthony H. Roccaro of Evanston; a daughter-in-law of Cabot, Ark. ; two sisters, Joyce Holmes and Elaine Booth, both of Evanston; 10 grandchildren and 13 great- grandchildren; two nieces and three nephews. She was preceded in death by her parents, an infant son, Robert Allen, and a son, Edwin F. Hinshaw, and a son-in-law. In lieu of flowers, memorials may be made to Tender Heart Hospice of Evanston. Arrangements are under the direction of Crandall Funeral Home of Evanston. EVANSTON - Funeral services for Evanston resident Robert "Bob" Wells Hinshaw, 83, will be conducted at 11 a.m. Saturday, March 29, at Crandall Funeral Home in Evanston. Interment will follow in Evanston City Cemetery. Visitation will be at 10 a.m. He died March 26, 2003, at his home. Born in 1919 in Evanston, he was the son of William E. and Vera Mae (Archer) Hinshaw. In April 1939, he married Marjorie Henley. The couple later divorced. In 1955, he married Annie Elizabeth (Robertson) Anderton. He was a member of the Church of Jesus Christ of Latter-day Saints and enjoyed the outdoors, gardening, and doing leatherwork. Survivors include his wife of 48 years of Evanston; two sons and their wives, Edwin Hinshaw of Cabot, Alaska, [sic] and Duane Anderton of Okahumpka, Fla.; three daughters, Linda Martinez of Evanston, Jerri McKenzie and her husband of Green River and Lola Eastman and her husband of Woodruff, Utah; sister, Helen Anderson, and her husband of Evanston; 27 grandchildren; and 25 great-grandchildren. He was preceded in death by his parents; an infant son, Robert Allen; and three brothers, Bill Hinshaw, Gayle Hinshaw and Jack Hinshaw. Our dear mom, grandmother, great grandmother and aunt passed away on January 20, 2012 at the Beehive home in Evanston, Wyo. due to age and renal failure. Annie Elizabeth Robertson Anderton Hinshaw was born the second child of seven to Maxwell Park and Sarah Elizabeth Hysell Robertson in Millburne, Wyo on March 17, 1920. She attended school in Mountain View and Robertson, Wyo. She was prom queen and loved to sew and cook. She belonged to the L.D.S. Church and served as secretary, visiting teacher and supervisor and Relief Society President. She also worked as a volunteer at the Rocky Mountain Nursing Home and hospital auxiliary. She always tried to encourage her family with family reunions. She married James Robert Anderton on Dec. 7, 1940 in Ogden, Utah. He passed away in 1953. She then married Robert W. Hinshaw on August 11, 1955. He passed away in 2003. She was preceded in death by her parents and her husbands, also a son Duane, brothers, Earl, Denver, Harold, John, and Vern Robertson and a sister Bernice (Kenneth) Keyes and a sister-in-law Leola Robertson and a step son Edwin Hinshaw. Funeral service will be on Wednesday, January 25, 2012, at 11 a.m. at the Crandall Funeral Home in Evanston. Friends may call at the funeral home on Tuesday evening from 6 to 8 pm and on Wednesday one hour prior to the funeral. Obituary of Robert Wells Hinshaw. Obituary of Edwin F. Hinshaw. 1920 census, Leray Township, Uinta County, Wyoming; roll T625-2029, ED 90, page 1A, line #31, dwelling #12, family #13. 1930 census, Sulphur Springs Township, Uinta County, Wyoming; roll T626-2625, ED 4, page 1A, line #1, dwelling #1, family #1.